Concord's Holiday Tradition is back for Year 2! A Christmas Carol: The Musical Ghost Story is a "ghostly" musical adaptation of the famous Charles Dickens classic featuring all your favorite characters, original music, spooky ghosts, and some unexpected twists and turns! As Ebenezer Scrooge wakes up the morning before Christmas, he has no idea an old friend is about to give him the scare of his life with the help of three ghostly companions. Scrooge must examine his haunted past, lonely present, and frightening future in order to rejoin his fellow man and discover the true meaning of Christmas. This original adaptation by NH native Joel Mercier includes bright costumes, stunning special effects, riveting choreography, and a cast of over thirty actors, singers, and dancers from all over the granite state. Start your holiday season off with a bang! 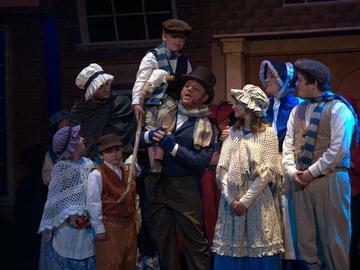 Performing at the Concord City Audi on Friday, December 7 @ 7:30 PM and Saturday, December 8 @ 2:00 & 7:30 PM.